Chances are, if you enjoy a drink from time to time, you’ve had one made by the Diageo. The largest spirits company in the world owns such varied brands as Guinness, Smirnoff, Ketel One, Gordon’s, Tanqueray, Captain Morgan, Crown Royal, Bushmills, Cuervo, Goldshlager, and Baileys. And their Scotches include single malts and blends from every scotch-producing region of Scotland, including Johnnie Walker. Marketing hype aside, I find this is indeed a sweet accessible single malt. The nose is sweet with some watermelon notes, and the color is a light and golden. On the palate, the Dalwhinnie 15 has plenty of peat and smoke. There was also malty sweetness with some oak, almond, and spice. The finish is long and sweet with just a touch of heat to remind you that you’re drinking an 86-proof spirit. Like most fine scotches, this will pair magnificently with cigars. The wood and sweetness of the Dalwhinnie would make a cedary cigar an excellent choice. I paired it with the Cuban Ramón Allones Specially Selected and it worked perfectly. Other cigars that should go particularly well are the Partagas Spanish Rosado, the Montecristo Petit Edmundo, the EO Cubao, or the Don Pepin Garcia Blue Label. 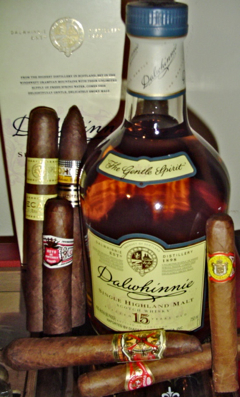 A riskier pairing, but potentially with a high upside, would be a maduro to match the Dalwhinnie’s sweetness. Ultimately, no matter which cigar you go with, or even if you pass on the cigar all together, the Dalwhinnie 15 Year single malt scotch will be an excellent choice. Is that an Opus X chili pepper in the photo? When will we get a review of that? just picked up a bottle tonight! One of the best whiskey.